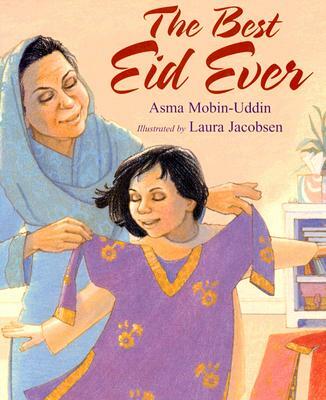 Author: Asma Mobin Uddin who is a doctor, a mom, and an awesome author! She has also written My Name is Bilal as well as Party in Ramadan which I previously reviewed here. Illustrator: Laura Jacobsen, who illustrates emotion warmly! Amazon Summary: It’s Eid, and Aneesa should be happy. But her parents are thousands of miles away for the Hajj pilgrimage. To cheer her up, her grandmother gives her a gift of beautiful clothes, one outfit for each of the three days of Eid. At the prayer hall, Aneesa meets two sisters who are dressed in ill-fitting clothes for the holiday. 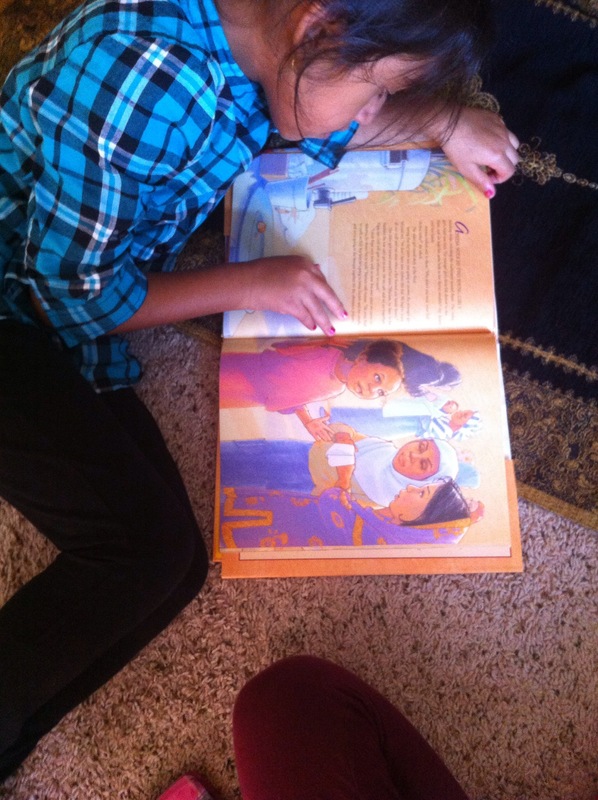 Aneesa discovers that the girls are refugees. Aneesa can’t stop thinking about what Eid must be like for them, and she comes up with a plan to help make it the best Eid holiday ever. 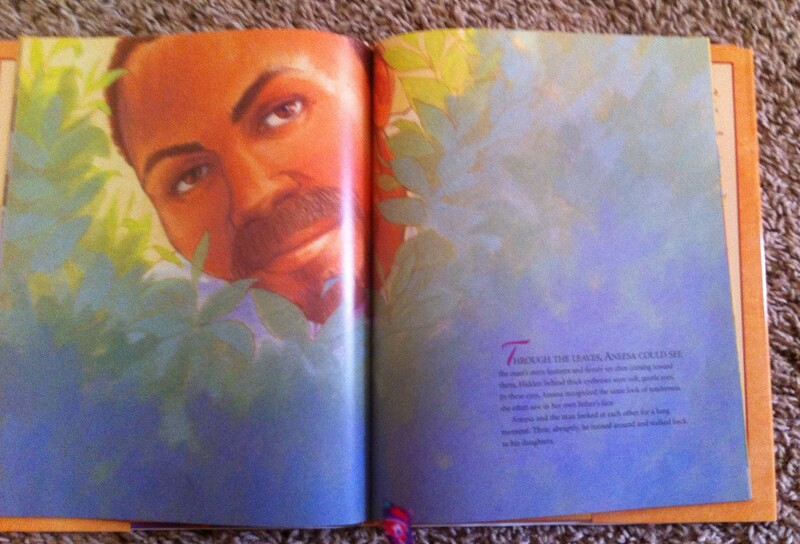 Through the leaves, Aneesa could see the man’s stern features and firmly set chin coming toward them. Hidden behind thick eyebrows were soft, gentle eyes. In these eyes, Aneesa recognized the same look of tenderness she often saw in her own father’s face. Aneesa and the man looked at each other for a long moment. 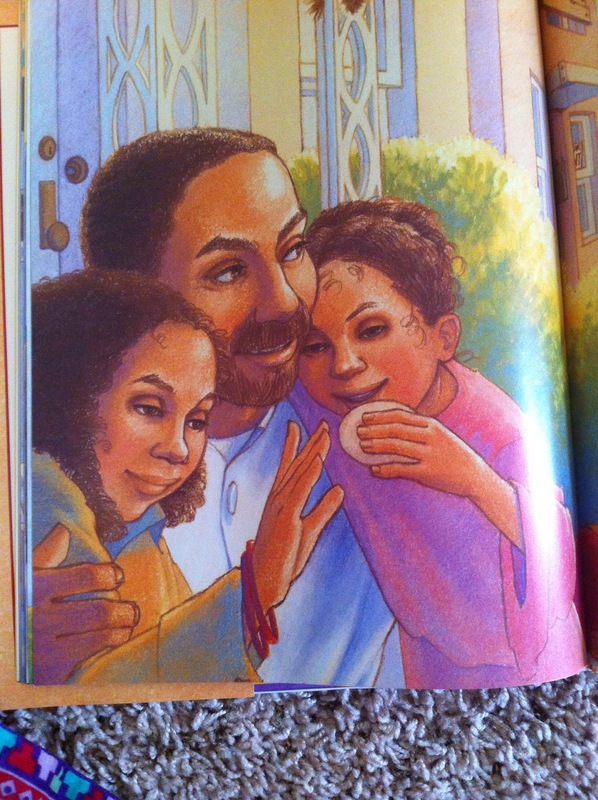 Then abruptly, he turned around and walked back to his daughters. The above quote goes with this illustration. 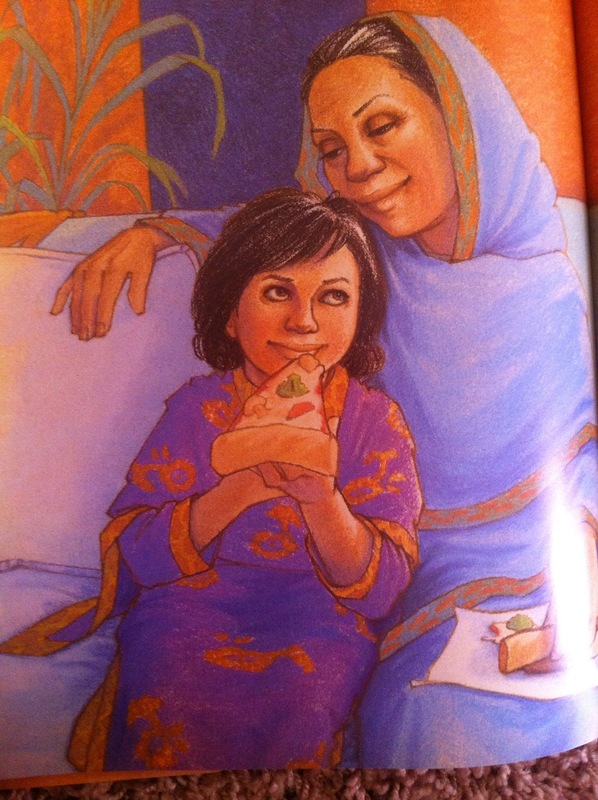 This page was my favorite page of the book in which Aneesa and her grandmother have delivered a basket of goodies to her new friends and they are afraid that the girls’ father will not accept the basket. Book Published by: Boyds Mills Press. I reached out to them for a review copy and I noticed my library didn’t have a copy of this so they donated a copy to me to give to the library – Atlanta Fulton library system so hopefully this book will be able to borrow from the Atlanta libraries v.soon! 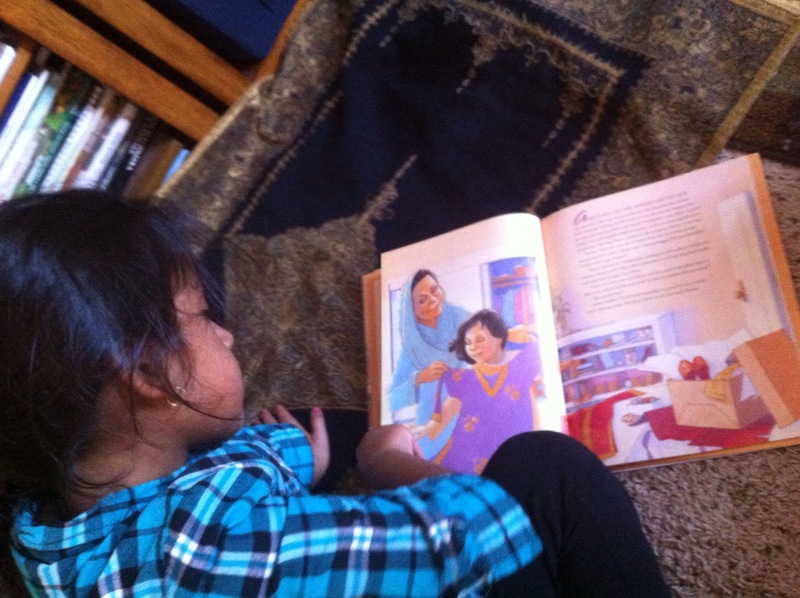 Niece’s thoughts: So I tried this story on my 8 year old niece who sat and read the whole story happily. 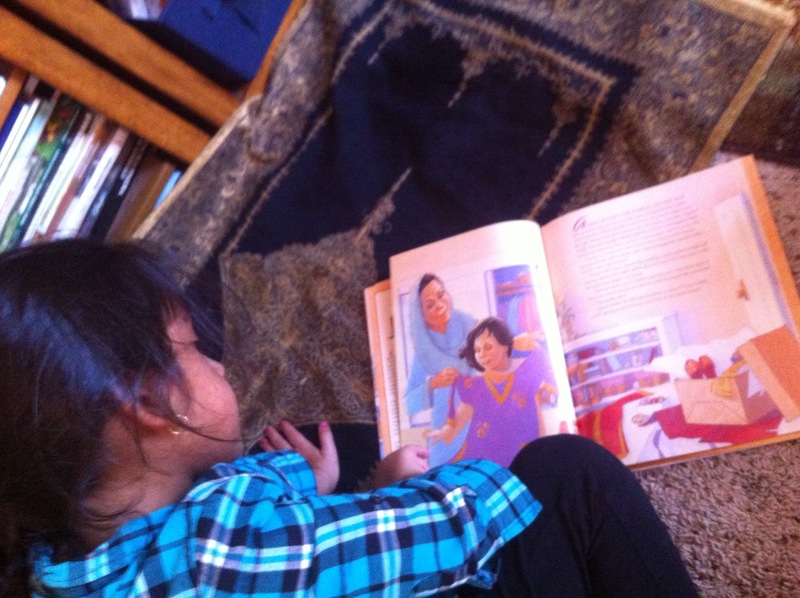 She said her favorite parts of the story were the beginning pages where Aneesa’s grandmother gifts Aneesa 3 sets of outfits, one for each day of Eid. Awards: Skipping Stones Honor Award, Middle East Book Award – Honorable Mention, Storytelling World Resource Honor Book Award, Best Children’s Books of the Year – Bank Street College of Education. Lots of awards for this special story! This story is officially a new favorite of mine! I brought it yesterdays to my mother’s home to share with my niece who enjoyed it as well as my grandmother who said it was a beautiful book! If I had one word for this story, it would be warmth. Sentences such as these are typical of the author’s tender writing. I love how Asma Mobin-Uddin’s words are full of emotion. Pair that with Jacobsen’s pastel illustrations, and this book is a special one. This is also an Eid story, in which this Eid is often overlooked as Ramadan does not come right before it, so I like that she wrote about a topic that is not often written about, and that she wrote it for a mainstream audience. I also love realistic fiction stories and I feel this story is easy to relate to for children. To read the author’s interview about this story and why she wrote it, visit this link here. I personally love seeing the thoughts behind a book! The author’s website is here and the illustrator Jacobsen’s site is here. Ah Reem. Just reading the review warmed my heart! I would love to read it too. I think pleasure is derived in this world by being sensitive to others’ needs and trying to bring happiness in some way, and that, in turn, brings happiness in our own lives…if we only but knew!! This story really hones in on this fact. Yes it is a really good story and shows how Aneesa gives away her 2 brand new eid outfits yet it makes it the best eid ever :). We really do need to help others to be happy!